I'm happy to announce the release of wadc version 1.2. 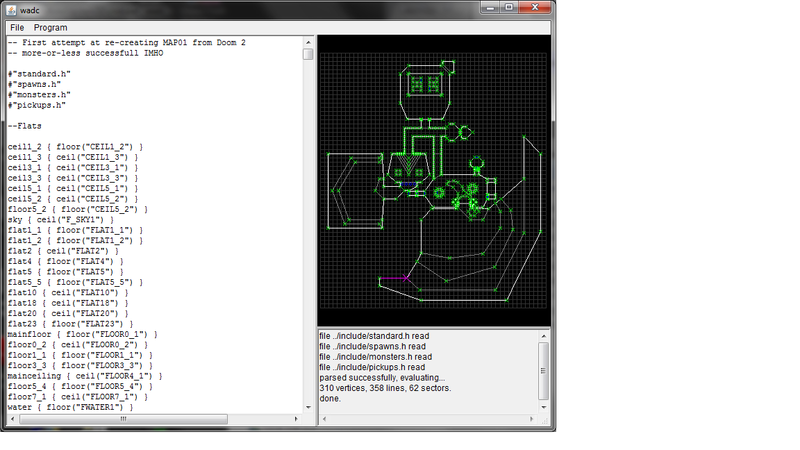 WadC is a functional programming language for the composition of Doom-format maps. Originally created by Wouter "Aardappel" van Oortmerssen, I was granted permission to take over the project over a year ago, but didn't get around to releasing anything until now. This version adds a few functions that permit you to draw two-sided lines which are textured and impassible: important for a lot of detailing techniques. You can also create friendly monsters for Boom-compatible ports. There's a new example demonstrating these features; plus a recreation of Doom 2's "entryway", courtesy of GreyGhost. See WadC for a summary, or go straight to the binaries or source on github.